Live Mongoose Captured on Kauai! You are here: Home / Blog / Live Mongoose Captured on Kauai! LIHUE – Live mongoose capture at Lihue Airport. 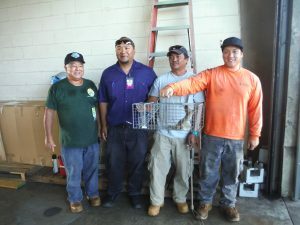 On October 11, 2016 at 8:15am, Craig Kaneshige, Clyde Ragasa, and Eric-John Garcia of Hawaii Department of Agriculture (HDOA) and the Kauai Invasive Species Committee (KISC) Field Crew, captured a live juvenile mongoose in the aircargo bay at the Lihue Airport. The capture was a community effort between Aloha Air Cargo employees and customers, Hawaiian Air Cargo employees, HDOA, and KISC. Aloha Air Cargo customers spotted the mongoose escape a shipment and quickly notified air cargo personnel. Shawn Baliaris, Aloha Air Cargo employee, and Leina, Hawaiian Airlines employee called in the report to HDOA around 5:45am. Aloha Air Cargo and Hawaiian Air Cargo employees monitored the mongoose orientation while waiting for responding agencies to arrive. KISC Field Crew and HDOA acted quickly, setting a trap line around the air cargo facilities. Effective mongoose reporting outreach, and strong community partnerships led to the rapid response and successful capture. 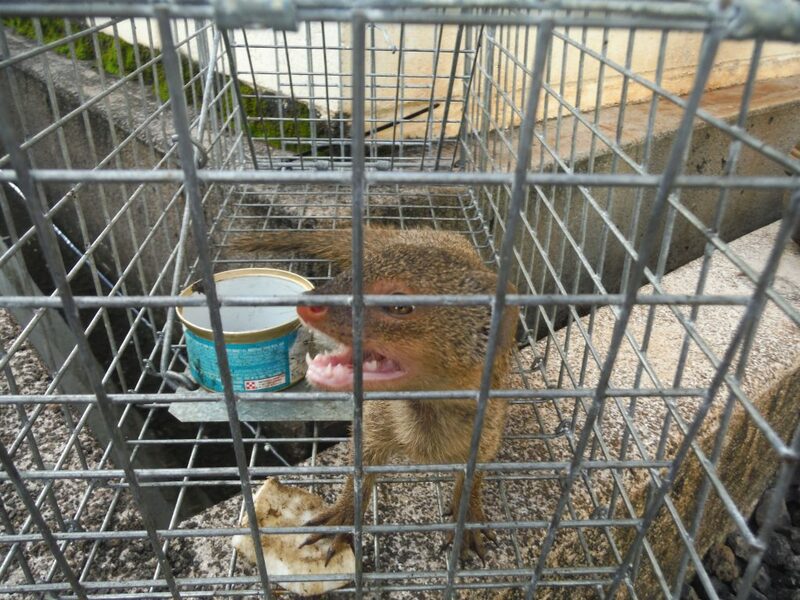 It is unlikely this captured mongoose is from a breeding Kauai population in view of the fact that it was witnessed exiting a recent cargo shipment. The only other live mongoose captures on Kauai were in 2012 in the Young Brothers port in Nawiliwili Harbor and the Kauai Marriot property near the airport. While HDOA and KISC are pleased with the rapid response and quick capture of the mongoose, this incident only demonstrates the need for a stringent and comprehensive state biological security plan, which would initiate higher security at exit and entry ports on all the islands. Recently, HDOA released a draft Hawaii Interagency Biosecurity Plan that is currently open for public comment. Proper biosecurity regulations can stop the introduction and spread of invasive plants, insects, animals, and pathogens. Mongoose are a threat to native and endangered ground nesting birds. Kauai and Lanai are the only islands without known breeding mongoose populations. 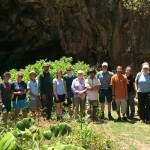 Therefore, preventing mongoose from becoming established will help to protect the limited number of endemic seabird, waterbird, and forest bird populations, some of which are only found on Kauai. United States Department of Agriculture (USDA) and HDOA will continue to monitor at Kauai ports. KISC, in partnership with USFWS – Pacific Islands Fish and Wildlife Office, will begin a comprehensive mongoose detection program by the end of the year to gain a better understanding of what Kauai’s status may be regarding possible breeding mongoose populations. Mongoose can hitchhike in cargo or shipments coming in by plane or boat, and can be found up to 2 km from the detection site. Please report any mongoose sightings to HDOA at 643-PEST or KISC at 821-1490.